Large room furnithed with three beds and suitable for a family sharing. 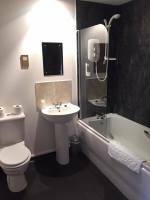 Ensuite facilities with shower & bath. Spacious accomodation with a relaxing atmosphere and a garden view. A lovely base to explore the surrounding Angus countryside and glens.